A Birmingham project which uses sport to improve the employability and life skills of disadvantaged young people has joined forces with Birmingham City University in an exciting new partnership. The collaboration will see the University work alongside Sport 4 Life UK to develop research projects, placements and volunteering opportunities, as well as sharing knowledge and enabling young people on Sport 4 Life programmes to learn about the opportunities on offer in higher education. 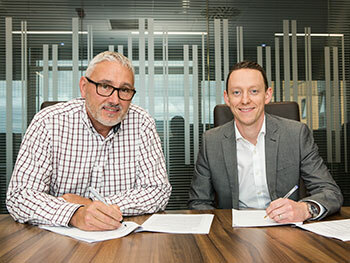 The partnership - signed today (3 October) at Birmingham City University’s City Centre Campus - comes as the University celebrates 175 years since the establishment of its forerunner institution, the Birmingham Government School of Design, in 1843. It follows the establishment in 2017 of a suite of Sports and Life Sciences courses, taught from the University’s recently expanded City South Campus, which hosts a range of facilities and industry-standard sports equipment. With our new sports courses and the Commonwealth Games coming to Birmingham in 2022, the timing of this partnership with an innovative city charity couldn’t be better. "Sport 4 Life UK is delighted to partner with Birmingham City University. As a Birmingham-based charity working with socially excluded and unemployed young people to create better futures, we are excited to be working with an establishment that actively reduces the barriers to under-represented and disadvantaged students attending, and succeeding at, University. “Birmingham City University is a modern, large, diverse and increasingly popular place to study, and has a huge presence in the city. It's also the seventh in the UK for employability, which is a key focus of Sport 4 Life UK. “We're looking forward to benefiting from their state-of-the-art facilities, working on joint initiatives, and having a pathway of progression and opportunities for our young people. And we're equally proud to be offering key volunteering, research and progression opportunities to the University and its students." Sport 4 Life UK aims to create better futures for young people aged 12 to 29 by improving their employability and key life skills, through sports-themed personal development programmes.